Poison gases were first developed and widely used as battlefield weapons during World War I. Among those weapons were chlorine gas, mustard gas, and the benignly named “tear gas,” all of which have similar effects, toxicity and lethality. Because of universal aversion to these weapons, a Geneva protocol was issued in 1925 banning their use in war. Subsequent international bans followed due to the persistent use of chemical weapons in war by some countries. Playing to the international aversion to these weapons, U.S. rulers have denounced Syrian president Bashar al-Assad as a monster based upon repeated accusations of his using chlorine gas against rebels and civilians during Syria’s ongoing civil war. In fact, posing as a moral authority, the U.S. led Britain and France in joint missile strikes against the Syrian government on April 13, 2018, in response to accusations that Assad had once again gassed Syrians on April 7th. Donald Trump then went further to threaten sanctions against Russian chemical companies for their role in supposedly enabling Assad’s chemical weapons production. If international military intervention against Syria and sanctions against Russia are justified responses to unproven government use of chemical weapons in Syria, what should be done to stop U.S. officials and their own chemical weapons manufacturers from producing and using military grade chemical weapons on their own subjects? And make no mistake about it, while tear gas is portrayed by officials as “non-lethal,” and “less-lethal,” it is not only lethal, but prison officials use it in quantities and manner that far exceed its known lethal limits. In fact, its very use in prison settings makes it especially lethal, because it is deployed most often inside closed-in cells. However, the quantities used by the U.S. prison officials inside prisoners’ cells as a matter of course is typically in the hundreds of grams. Six-hundred grams is the quantity generally authorized by prison policy—which is over 100 times the legal estimated lethal dose. And because characterized as a “non-lethal” weapon, these agents are deployed against prisoners as a first resort to force for the slightest claimed disruption, defiance or infraction committed by them while locked inside a cell. Actually as a former Florida guard revealed to the Miami Herald, guards are trained as part of a “code” to fabricate reports against prisoners, to speciously justify beating and gassing them. If not for many prisoners having learned improvised methods of protecting themselves from the lethal effects of tear gas in some situations, there would be a great many more prison gas fatalities. I should add, however, that many fatalities do occur but are effectively covered up by being falsely reported as death by “natural causes,” instead of as murders by asphyxiation. And aren’t these the same sorts of cover-ups U.S. officials accuse Assad of using when he’s been accused of killing Syrians with chlorine gas? I’ve witnessed such murders by “natural causes” up close. One case being the October 2013 killing of Christopher Woolverton, a mentally ill asthmatic man who was confined in solitary with me at the Clements Unit prison in Amarillo, Texas. After he was left lying unresponsive and in medical distress on his cell’s cold concrete floor for three days by guards and medical and mental health officials, they had Woolverton sprayed with some 600 grams of tear gas—although he was under medical “do not gas” orders because of his asthma. Several hours later he was dead. The facts surrounding Wolverton’s murder only came to light because I filed grievances in the prison about it and encouraged other prisoner witnesses to also do so, and I publicized it to the outside. (7) As a result, Woolverton’s family read and learned about the situation online (prison officials did not notify them that he was dead,) and they brought a federal wrongful death suit. 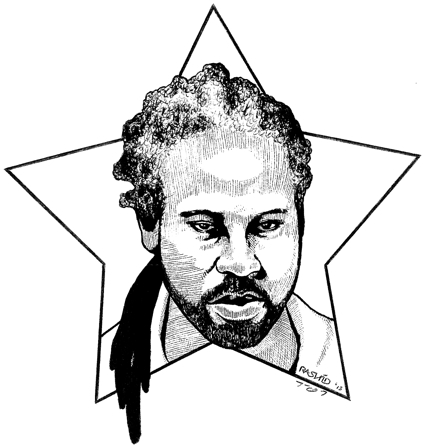 U.S. prison deaths like Woolverton’s aren’t uncommon, they’re just rarely publicized. His death too was initially blown off as by natural causes. Tear gas in the prison setting can be described as nothing but a weapon of torture. How else does one characterize a weapon that’s designed to create the sensation that one’s flesh and mucous membranes are on fire, and causes one to suffocate? Imagine the pain of one’s eyes, nasal passages, lungs and flesh being aflame, without relief. And the constant “upgrades” that U.S. manufacturers make to tear gas, is in part to enhance the severity of this pain and make the agents harder to flush from one’s flesh. The abuse of such weapons (in the pain inflicted) is worse than the lashings and beatings inflicted on slaves in the old South, and the terror just as effective. Only tear gas may be regularly abused without leaving the telltale scars of other forms of physical torture. Not only are these barbaric abuses and murders a daily occurrence in U.S. prisons, but to prison officials they’re part of a game fueled by a deranged and sadistic culture and sense of official entitlement to degrade, torture and murder powerless people. This reflects the uniformity of abusive attitudes and practices, or tacit complicity, of U.S. prison officials towards prisoners and the secretive culture that conceals and enables it. To get a sense of how completely this culture is embraced by prison officials, consider that when at full capacity, Florida has 24,000 prison employees. So, 6000 members on a closed Facebook page where guards openly mock prisoners they have murdered, and threaten journalists who publicize such abuses, is fully a quarter of the systems entire staff. Actually it’s a much larger percentage when you consider that Florida’s prisons are notoriously understaffed. But U.S. officials denounce regimes like Assad’s in Syria as corrupt, murderous and secretive, and they never lose the opportunity to self-righteously critique the human rights records and treatment of prisoners in countries they dislike. So, if chemical weapons abuses in Syria that leave people suffocating, foaming at the mouth and dead are evil and justify international military responses, who will intervene to stop U.S. officials from doing the same to us? And who will sanction the four major U.S. companies that constantly upgrade and sell the deadly military grade chemical weapons used against us to prisons across Amerika: namely Combined Tactical Systems, Sabre, Safariland and Sage? Now, what if someone dared to militarily strike Amerika, as the U.S., Britain and France just did to deter uses of chemical weapons in Syria…Well, that’s unthinkable, isn’t it? Just an example of the utter hypocrisy of U.S. rulers who go around the world masquerading as opponents of injustice and pretending to have the moral (or might I say imperialist and racist) authority to police everyone else, when in reality they are the greatest purveyors of injustice in the world. 4 Julie K. Brown, “Culture of Brutality Reigned At State Prison in Florida Panhandle,” Miami Herald, March 21, 2014.